The Global Volcanism Program has no activity reports for Bishoftu Volcanic Field. The Global Volcanism Program has no Weekly Reports available for Bishoftu Volcanic Field. The Global Volcanism Program has no Bulletin Reports available for Bishoftu Volcanic Field. The Bishoftu volcanic field, also known as Debre Zeit, consists of an area of fissure-fed Holocene lava flows, cinder cones, tuff rings, and maars. Several of the maars are filled by lakes, which are popular recreational destinations from the nearby capital city of Addis Ababa. Most of the craters and cones are aligned NE-SW, parallel to the direction of the Ethiopian Rift Valley. The 750 x 1000 m wide Haro Maja tuff ring and its neighbor, lake-filled Kilole, are offset to the east. The cones and maars of the volcanic field were erupted through rhyolitic welded tuffs. Mohr P A, 1961. The geology, structure, and origin of the Bishoftu explosion craters. Bull Geophys Observ Addis Ababa, 2: 65-101. The Global Volcanism Program is not aware of any Holocene eruptions from Bishoftu Volcanic Field. If this volcano has had large eruptions (VEI >= 4) prior to 10,000 years ago, information might be found on the Bishoftu Volcanic Field page in the LaMEVE (Large Magnitude Explosive Volcanic Eruptions) database, a part of the Volcano Global Risk Identification and Analysis Project (VOGRIPA). There is no Deformation History data available for Bishoftu Volcanic Field. There is no Emissions History data available for Bishoftu Volcanic Field. 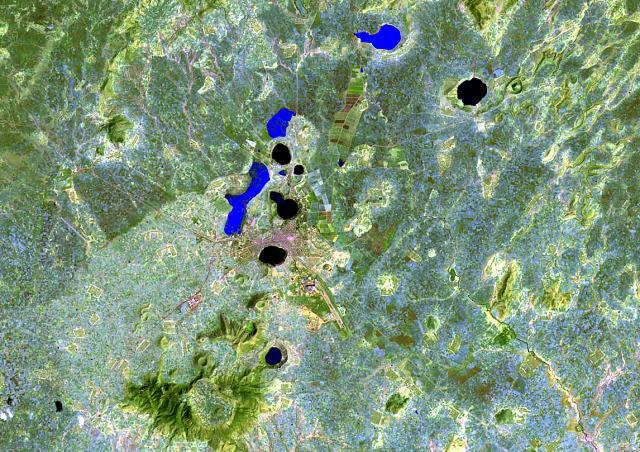 A chain of lake-filled maars (dark-colored in this Landsat image), tuff rings, and cinder cones, lies along the Ethiopian Rift Valley SE of Addis Ababa and forms the Bishoftu volcanic field. The city of Debre Zeit (left-center) lies between two maars, irregular-shaped Lake Hora and circular Lake Bishoftu. The Haro Maja tuff ring and its neighbor to the west, lake-filled Kilole maar (upper right), are offset to the east. There are no samples for Bishoftu Volcanic Field in the Smithsonian's NMNH Department of Mineral Sciences Rock and Ore collection. IRIS seismic stations/networks Incorporated Research Institutions for Seismology (IRIS) Data Services map showing the location of seismic stations from all available networks (permanent or temporary) within a radius of 0.18° (about 20 km at mid-latitudes) from the given location of Bishoftu Volcanic Field. Users can customize a variety of filters and options in the left panel. Note that if there are no stations are known the map will default to show the entire world with a "No data matched request" error notice. Large Eruptions of Bishoftu Volcanic Field Information about large Quaternary eruptions (VEI >= 4) is cataloged in the Large Magnitude Explosive Volcanic Eruptions (LaMEVE) database of the Volcano Global Risk Identification and Analysis Project (VOGRIPA).